Minor defects are described as “A defect, other than a major defect”. The overall extent of minor defects is described within the report. This includes minor blemishes, corrosion, weathering, paint deterioration, wall dents due to physical damage and the like. It is expected that defects of this type would be rectified as part of the normal ongoing property maintenance. Paint deterioration may appear cheap to fix but if you have to paint the entire weather board dwelling then you will need $15,000 plus depending on the size. See below re some photos of maintenance defects/issues. Mr Inspectors qualified building inspectors carry out pre-purchase inspections in Melbourne and the bayside area providing comprehensive inspection reports to assist home buyers ascertain potential costs associated with defects. The purpose of a building inspection is to report on major defects, safety hazards and form an overall opinion on minor defects. We describe the above defects - what they are, where they are and what needs to be done to rectify or have further assessed and provide photos. The photograph above depicts a tile that has been pushed back potentially allowing water ingress. Technically this could be processed as a major defect as it may allow water ingress and further damage. However, I believe this to be a minor defect as it takes 2 seconds to pull the tile back into place. If you have any questions at all Mr Inspectors qualified inspectors are on the phone until 10.30 p.m.
Mr Inspector is a qualified building inspector in Melbourne with 12 years experience and carries out building and pest inspections for persons purchasing homes. The above photograph shows powder post borer to a timber member in the roof frame and was detected during a building inspection in Melbourne. This is often seen in conventional hard wood timber and misdiagnosed by some as Termite damage. We have often had to go to homes because someone like a cable installer has stated termite damage exists. Powder post borer do minimal damage to timber and once they have consumed the sap wood they normally die. If a around 30% of a timber member has been damaged by borer it is preferable to have it replaced, especially if it is a structural load bearing timber member. Mr Inspector is one of few actually qualified Building Inspectors conducting pre-purchase building and pest inspections in Melbourne and for 12 years has been assisting home buyer make the right decision. The above photograph was taken by Mr Inspector during a building inspection in Thornbury, Melbourne, and depicts a door bolt that has been inserted the wrong way. This is very minor in the scheme of the inspection but technically something which should be reported in the building inspection report as required by the Australian Standards for pre-purchase building inspections. Some building inspectors will report on this and others won't. This is not due to incompetence, merely that the Australian Standards state that we do not have to report on each individual minor defect, rather include an overall opinion in regard of minor defects. I recently heard of a building inspection client complaining that a door hinge screw was missing that was not reported on and had been quoted $270 to repair. A hinge screw cost 10 cents. We include every conceivable minor maintenance type defects within our reports, so basically going over and beyond what is required of us as per the Australian Standards. We do this because when you are spending so much money on a home these days we think you should know everything that is wrong with it. The above photograph was taken by Mr Inspector, a qualified and independent Building Inspector in Melbourne during a building inspection and depicts powder post borer damage to a floor joist. The photographs was taken during a recent building inspection in Prahran Melbourne and our client was concerned that the damage was termite damage. This is a common error that people make, including builders. There is a large difference between borer and termites and what they actually do to timber. Powder Post borer attack the sapwood in hardwood timber and this can include roof frame and floor frame. The sap wood in the timber normally is within the timber when milled and powder post borer eat it and then die. They leave a fine powdery dust behind, hence the name powder post borer. Most of the time the timber member that has been attacked does not need to be replaced. During a lot of our Building Inspections in Melbourne, we come across borer damage, especially older homes constructed from hardwood. Newer homes using pine framing do not experience powder post borer problems. I will endeavour to include other borer articles soon, as some pine flooring can be attacked by borer and this also has people worrying that it is termite damage. If you have any questions or concerns please contact Mr Inspector. Mr Inspector, a qualified building inspector in Melbourne carries out pre-purchase building and pest inspections Melbourne wide. The above photo depicts what is a minor defect that is required under the Australian Standards fro building inspections to be included in all house inspection reports. Some building inspectors may class this as a major defect due to a leak possible causing further deterioration to the dwelling e.g. the vanity. Technically it probably is but such as easy fix that we believe this is a minor/maintenance defect. 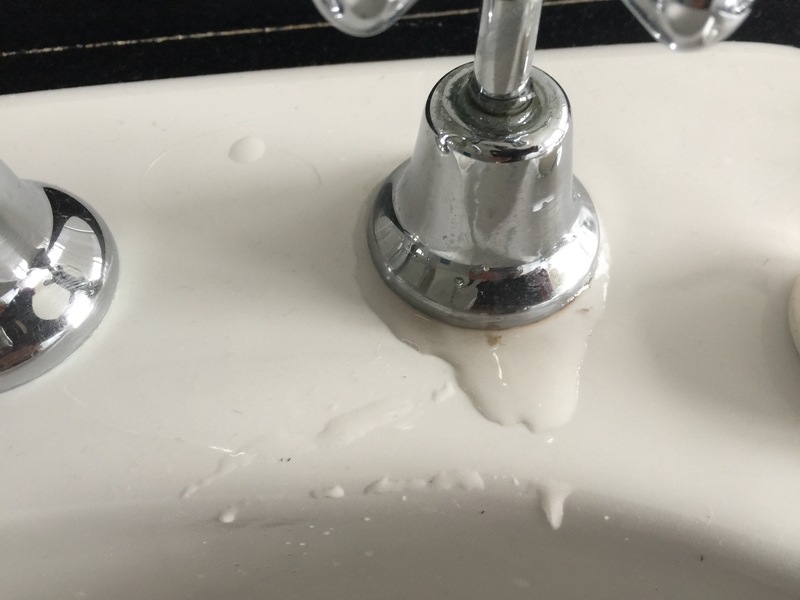 All taps, traps, plumbing and toilets are checked by Mr Inspector during his house inspections as required by the Australian Standards for pre-purchase building insepctions. Mr Inspector carries out comprehensive building and pest inspections Melbourne wide with a focus on locating structural defects, major defects, safety hazards and maintenance defects requiring repair or replacement and current or past termite infestation and damage. The above photograph was taken by mr inspectors qualified building inspector during a building inspection in St Kilda and depicts timber fungal decay (rot) in a window frame. Ultimately, any timber decay or rot should be replaced rather than patched as depicted above. We often see window frames that have just been patched and the timber becomes spongy if not all the rot has been removed or replaced. This will will worsen over time and cause further decay of the frame, whereby total replacement is recommended. Technically, this would be considered a major defect, however this is easily rectifiable by a qualified carpenter. If you need any assistance when purchasing a home in Melbourne, please feel free to call mr Inspector and he will be able to assist. Mr Inspector conducts building and pest inspections around Melbourne and surrounding suburbs and took the above photo during a building inspection in St Kilda, near Elwood. The photograph depicts the roof void of the home and shows that the insulation was thrown into the roof space and never laid. Mr Inspector spoke to the home owner who stated that the insulation was installed during the State Governments Insulation rebate scheme and she was of the belief that it was installed properly. This is a good reason why people should have annual building inspections carried out by qualified building inspectors in Melbourne so that defects and poor workmanship issues like the above can be detected and addressed. Mr Inspector, a qualified building inspector in Melbourne, took the above photograph during a building inspection he carried out in Hampton East which shows a cracked roof tile. 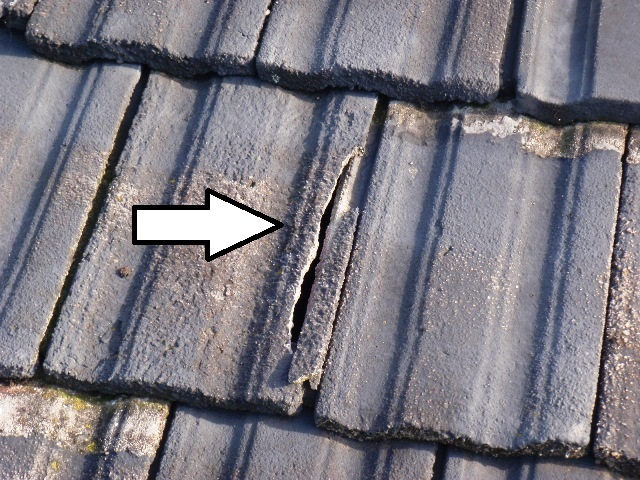 Cracked roof tiles are commonly seen during Mr Inspectors Home Inspections due to age, trades person walking on same and the like. Hail damage is also a cause of many cracks in tiles. Technically this is considered a major defect as further deterioration (leaking into the roof and ceiling) may occur if it is not replaced. Replacing a roof tile takes about 20 seconds so in the scheme of things it is an easy fix, but one that must be replaced as soon as possible. This actual house inspection in Hampton East did not show any evidence of staining on the bedroom ceiling directly under this cracked tile but the thermal imaging camera picked up the dampness. This would not be seen by a potential buyer during an open for inspection and the reason why you should get a qualified and experienced building inspector with the knowledge and advanced tools to carry out a thorough inspection before you buy. The photograph above was taken by Mr Inspector, a qualified house inspector, during a building inspection in Mentone. Although a minor maintenance issue and not a reason to walk away from a house purchase it remains an issue requiring rectification. Gutter debris will cause rust to the gutters, block the down pipes and then rust them as well. When they are all leaking it can cause timber rot to fascia, damage to eaves due to overflowing in heavy rainfalls, rot to window frames and this excess water leaking is also conducive to termites. Replacing guttering on a standard home can cost you anywhere from $2000-$4000. Cleaning them out costs you nothing. This portrays the importance of having a qualified building inspector in Melbourne to carry out a building and pest inspections to locate defects around a home that normally would not be picked up. Mr Inspector, a qualified Building Inspector in Melbourne conducts building and pest inspections for home buyers, providing detailed inspection reports so that they can make informed decisions before buying a property. The photographs above was taken during one of our building inspections in Dingley and shows a heating duct that has detached. Mr Inspector conducts a thorough inspection under every home as this is where a lot of defects are found during our building inspections around Melbourne. 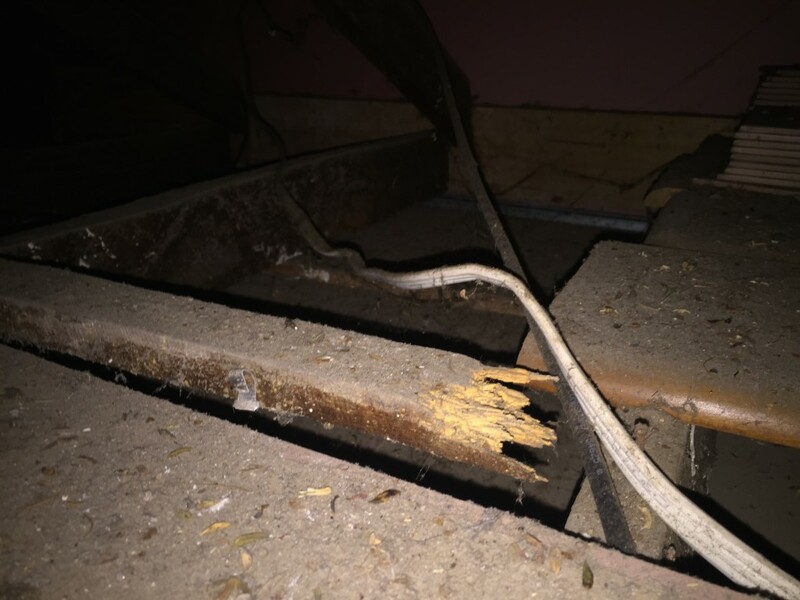 Our home inspectors come across structural defects where stumps are rotten, major defects where bathrooms are leaking causing rot to the floor boards and floor frame and minor defects like the photograph above. The detached duct was not known to the owners who were unaware that one end of the home was not being heated and instead the sub floor was being kept warm. We often see damage to duct work that has been caused by cats scratching holes in the duct and sleeping soundly. The importance of a building inspection is reiterated by this finding, although relatively minor in the scheme of things, you are still wasting money on heating.